So when I spotted a new eatery named “Shaurya” sprung up along the Aundh-Hinjewadi road, I did not pay much attention to its existence. I must admit, being a foodie, such indifference for an eatery is uncalled for. However, the origin of this apathy lies in the fact that there are cluster of food joints spanning along this highway, which have set an unprecedented bad reputation in more than one way. Before I give into the temptation and digress, let me drag myself back to the subject. It was only when my supervisor turned up on my desk one Monday morning, and during our idle chatting that you tend to do more often on Mondays to cope up with lethargic Monday blues, he mentioned about his weekend dinner at this new place. Now, there is a reason why I would take his word as gospel. He spends nearly every weekend trying out various restaurants in Pune with similar regularity that is exhibited by Catholics visiting church for their Sunday Mass, and has earned a reputation of being a subject matter expert on eateries in Pune. As new food joints crop up anywhere in city and is brought to his notice, he feels he is obligated to pay a visit to that place and get a firsthand experience. Few weeks later, when we were finalizing venues for our quarterly team gathering, the idea of visiting “Shaurya” came up and we all agreed to it in unison. The party was nothing worth writing about just the usual affair of food, booze and bickering and back-biting. I felt fascinated by the food, and this chutney caught my attention. 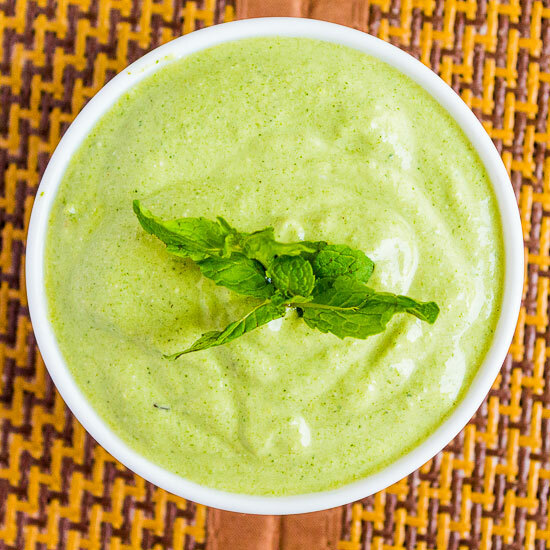 This light green colored, smooth in its texture and an interesting combination of sour and spicy chutney provided a pleasant breakaway from the spicy green chutney that other food-joints typically offer. Like other chutneys, this one too is easy to make and serves as an appetizing accompaniment with Tandoor dishes. The recipe calls for strained yogurt (exact quantity can be found in the recipe section below) which can be obtained by tying home-made or market-bought yogurt in a muslin cloth and leave it suspended for an hour or more to get rid of the liquid whey. 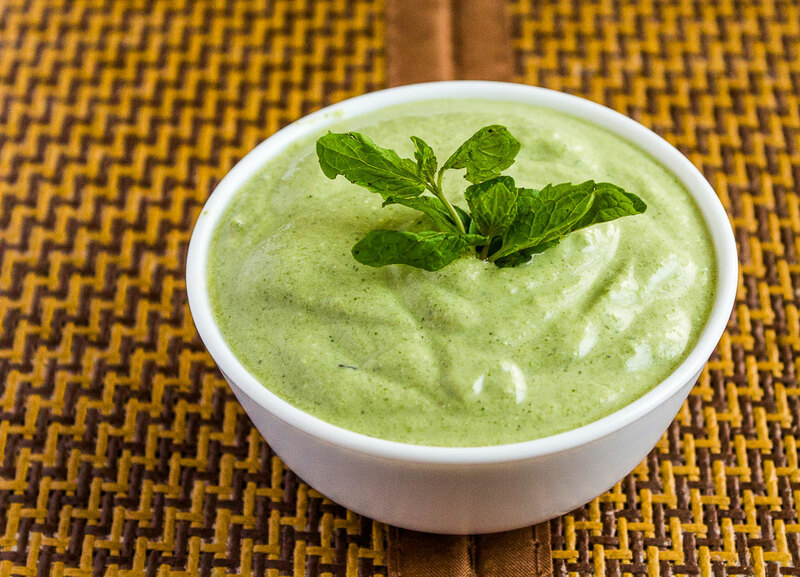 A green paste is formed by grinding together mint, coriander leaves, chilies, garlic and onions. 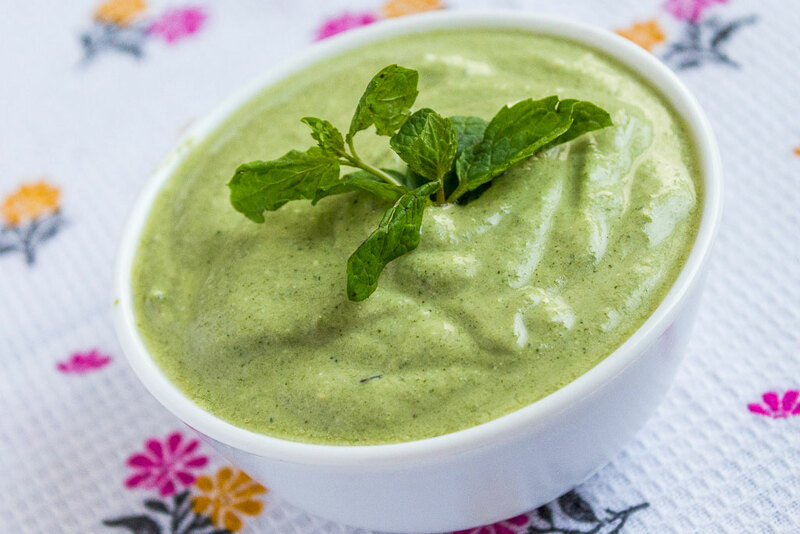 This green paste is blended in with the whisked yogurt and few more ingredients are added to enhance the taste. The idea of adding yogurt to this chutney is, according to my beliefs, a real game-changer. It not only provides a smooth texture to it, but also adds sourness to the recipe. Serve this chutney when you make tandoori dishes at home. You can share your feedback about this recipe in the comment section below. 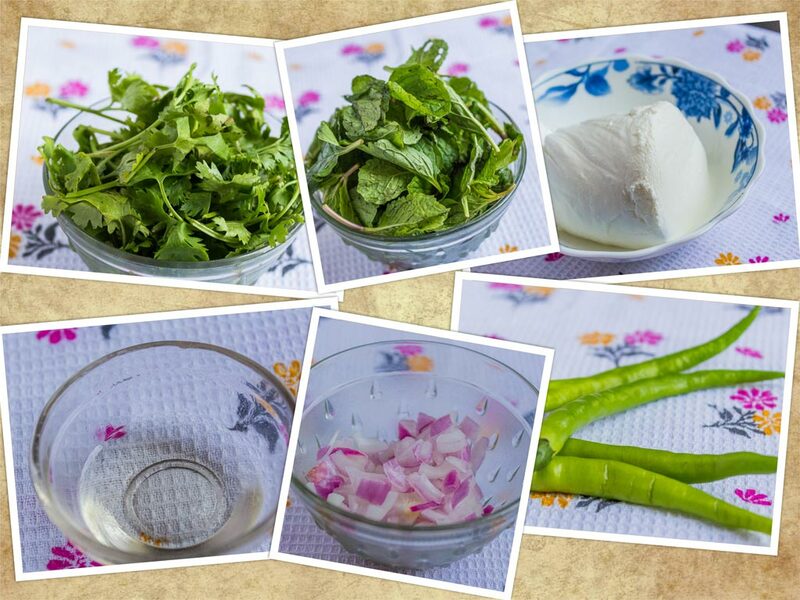 In a grinder jar put mint leaves,Coriander leaves, garlic,Green Chilies, Onions. 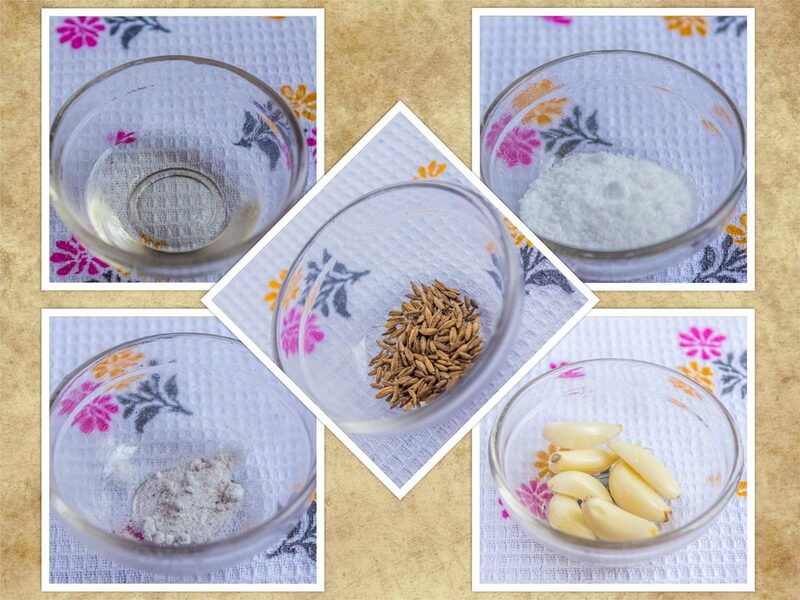 Grind these ingredients into a fine paste. Whisk the hung curd in a large bowl. Now add green chutney to whisked curd. Add roasted cumin seeds, black salt,Cooking Oil,salt. Mix all the ingredients evenly.